Exploring Union Market -- donuts from GBDLoad up locally: Instead of spreading gourmet gift purchases out over a number of stops, think ahead. If you include a food-focused retail destination on your errand list, grab several unique items. You'll be happy you had a few little things stocked up when Saturday (suddenly) rolls around and you have three parties to drop into and no time to grab wine or flowers. 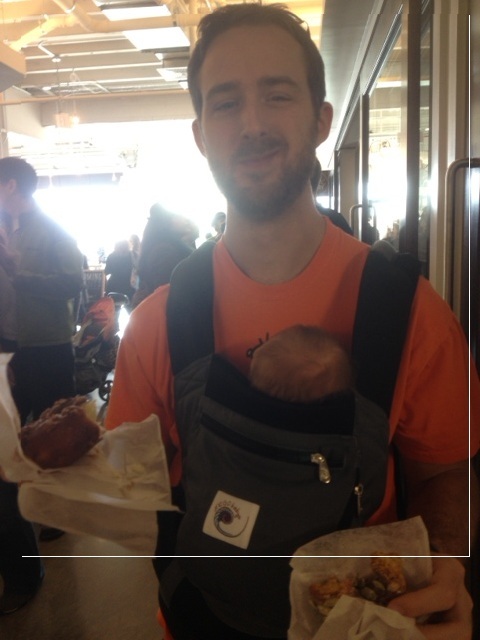 And support locations that are family-friendly -- I was amazed and excited by the amount of strollers and ErgoBaby carriers during my first trip to Union Market in D.C. I picked up a number of stocking stuffers and fun treats for around $10, including barrel-aged syrup, charcuterie and savory crackers laced with Old Bay. A stop at a neighborhood wine shop yielded (in about 5 minutes) pumpkin chevre and cranberry brie discoveries and a sparkling wine from Texas, and I was encouraged to set my car seat carrier on the bar and enjoy a glass of spicy cranberry sangria. Cooking? Simplify: A few of my favorite appetizer contributions with five ingredients or less and ready in less than 30 minutes. Pop-up exploring: Plenty of places around DC that spotlight unique food and wine gifts also welcome children. There are a growing number of wineries within a 45-minute drive of DC, many of which offer holiday discounts and treats from local artisan purveyors. Organizations across the region hold holiday bazaars and festivals in November and December, including the Swedish Christmas Bazaar at the House of Sweden and the National Harbor Holiday Festival. Work downtown? The Downtown Holiday Market, F Street between 7th and 8th Streets, opens Nov. 30 and this year features food from Luke's Lobster, Shake Shack and Ris, as well as fair-trade coffee, mini donuts and empanadas. Delicious gifts for each other: Dates exploring restaurants -- including sitter arrangements -- make a great gift for any food freak and gives each of you something to look forward to throughout the year. Couple a gift card to a new eatery you want to explore with scheduling suggestions (once a month?) and don't forget child card arrangements. The more you plan, the more likely you are to actually go -- and enjoy it. And take the time to pick up the gift certificate if the restaurant tries to charge you to "ship" it -- or better yet, contact another spot that doesn't charge extra for gift card orders. Can't get out? Use the cards for take out, or gather specialty groceries to cook at home together. Specialty Food Report Card: What are you buying … and why?